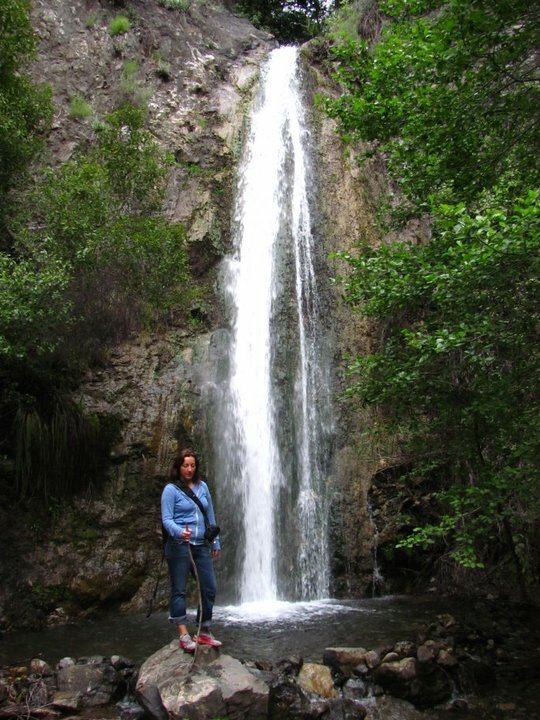 Falls Canyon Falls is a little known waterfall located less than a mile from Trabuco Creek Road in Mission Viejo. Its so secluded and secret that I almost feel bad for listing it on Yelp. The waterfall is a single tier which plummets over 40 feet off the cliff face at the end of the canyon. The waterfall can very impressive when its flowing after a good rainstorm. The falls are primarily spring fed and should flow for most of the year. The hike to the falls is extremely easy and takes less than 15 minutes from Trabuco Creek Road. The trailhead to the falls is located a little over three miles from the intersection of Trabuco Canyon Rd and Trabuco Creek Rd. The trail is a little difficult to locate because it is not marked by any marker or sign. The best way to get to the falls trail is to drive down Trabuco Creek road until you see a the sign for the San Bernadino Forest. Trabuco Creek Rd can be a bit rough, but any front wheeled vehicle should easily be able to handle the ruts and bumps. After you enter the San Bernadino Forest, you will have to keep an eye out for a small tributary which flows into Trabuco Creek from a narrow canyon on the left side of the road. Park your car in the nearest turnout and follow the tributary upstream into the canyon for approximately one mile to reach the falls. The canyon is very narrow and it requires several stream crossings. You wont be able to get lost on trail because the canyon walls are very steep. The Falls are located at the end of the canyon so you wont be able to miss them from the trail. Watch out for poison ivy and poison oak on the trail. After you see Falls Canyon Falls, you can return to your car and drive a bit further down Trabuco Creek Rd and you will eventually come to the Holy Jim Trail which features another waterfall, although a bit smaller and less impressive than Falls Canyon Falls. ATTENTION: Always stay on the trail. Several hikers have gotten lost this year in Trabuco Canyon.